Make a power wheels jeep that is controlled by an XBOX controller. This particular build is using Power Wheels® Jeep® Hurricane with Monster Traction™ but should be usable across many different types of power wheels with small adjustments. I wanted to do this project so I could drive my kids around. They are 2 and 3. We take the jeep out a few times a week. It’s great for going to the park or just walking around the neighborhood. It works kind of like a stroller as far as containing and protecting them, but obviously way awesomer. This project has also been built with expansion in mind. Because the motor controller boards have feedback, and there’s plenty of room left on the Arduino microcontroller, it will be easy to add things such as proximity sensors and driver profiles. That way, when I give it to my little boy to drive himself, I can set the driver profile to be gentler as well as activate proximity sensors so he can’t ram a tree. Also, in essence this entire build is a fairly simple way to get a robot off the ground. 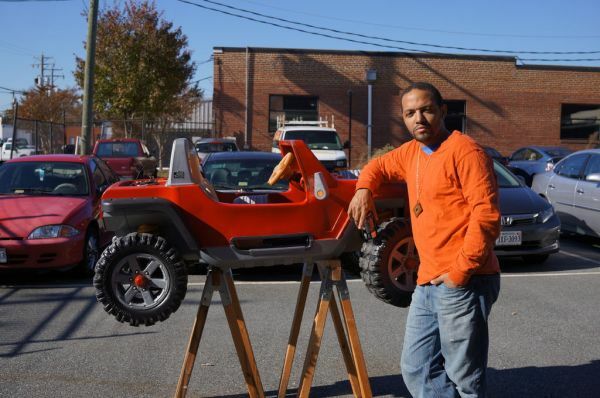 My project was particular to the power wheels because I’d been dreaming of sitting on my porch with my controller and driving my kids in the yard, but really the setup could apply to anything with motor driven wheels and a steerable front end. (motor size etc taken into consideration of course). I hope you enjoy reading about my project as much as I did making it. And if you do decide to tackle this Instructable and build your own, please contact me for any questions. I want to keep improving this so as many people can take that old Power Wheels and make it into the coolest thing on the block. Now let’ s make it! Connect the Arduino to the USB Host shield, then connect that to the Wireless gaming receiver. Connect both motor controllers to the Arduino so they are controlled by the Xbox controller. Build a custom steering mechanism that is controlled with the linear actuator. The first thing is get the Xbox controller communicating with the Arduino via theUSB Host Shield. All of the pics included in this Instructable show an Arduino Mega, but in reality, an Uno is all that is needed for the USB Host Shield and only 2 digital outs. Plug the USB Host Shield onto the Arduino. For now, power the Arduino with you’re computer. Next plug the Xbox 360™ Wireless Gaming Receiver for Windows®. Once these connections are made load code shown below into the Arduino which allows the Arduino to perform steering operations based on input from the controller. There’s plenty of notation to help understand what’s going on. and steering remotely-controlled via Arduino. * has not been fully tested, but I’ve gone over 50ft without any noticeable loss in signal. * and motor controllers. The Xbox Receiver is attached to a metal pole antenna-style. /* The sample code for the Xbox controller gave a deadzone of -7500 to 7500. // Here, let’s determine the speed and direction. 1 serialBytes = 0xC0 + (target & 0x1F); // Command byte holds the lower 5 bits of target. Each motor controller requires a specific profile. These will specify the power and speed at which the motors are engaged when they receive a signal from the Arduino. You can copy them from below, or you can get the settings from my github entry. 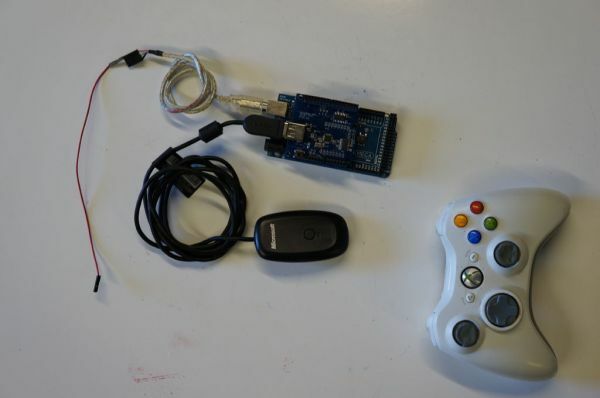 The Pololu USB Software Development Kit is needed to program these controllers. Here’s a link on how to download and use that SDK so you can use the code below. The SDK works for both motor controllers.